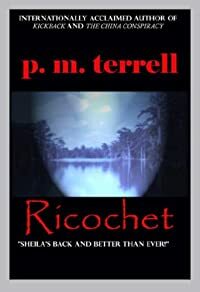 Ricochet by P. M. Terrell, a Mysterious Review. While recuperating in the hospital, her aunt brings her pictures and hand-written notes of her mother's last days before her sudden death. She leaves the hospital without telling anyone and embarks on the violent and secret journey that her mother had started but never finished. She runs into unknown men dealing in drugs, a woman in red who helps Sheila find her way when she is lost, and men and women who are experts in the art of forging documents for the purpose identity theft and illegal immigration. Terrorists and sleeper cells also become a threat for Sheila. She searches out all these criminals and while doing so they are searching for her, too. Ricochet is written in the first person allowing Sheila to tell of her exploits in her own words. The image formed in the reader's mind is of a woman who is a cross between Wonder Woman and the Bionic Woman. In contrast to these superheroes, however, Sheila has little regard for Quantico's rules and regulations or the orders from her superiors. As befits the title, she ricochets across the country as she flits from one problem to another without any clear objective in mind. Both the criminals and her own people can't figure out what she is going to do next. Special thanks to guest reviewer Betty of The Betz Review for contributing her review of Ricochet. Acknowledgment: Author Marketing Experts provided a copy of Ricochet for this review.